Today we went to a Bowling birthday party, her first time bowling! Unfortunately one of the first things she tried to do was run after the ball. Anyone who bowls will remember how oily those lanes are… so yes, she took one step and immediately landed on her back. Poor honey was so stunned it took her like a minute to finally wail away. Of course we held and comfoted her quite a bit, checked her out to make sure she was fine, etc. Eventually she calmed down, and was even willing to bowl a bit again, but only with the birthday girl's help. 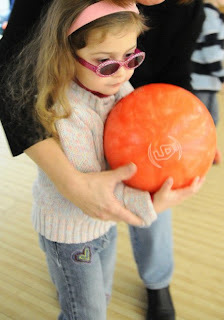 Hopefully she's not scared of bowling, I'd love to do it as a family when she gets older!